An innovative newsletter design that feels like a premium magazine, where traditional articles are replaced with feature stories, and where quality photography helps audiences engage and identify. 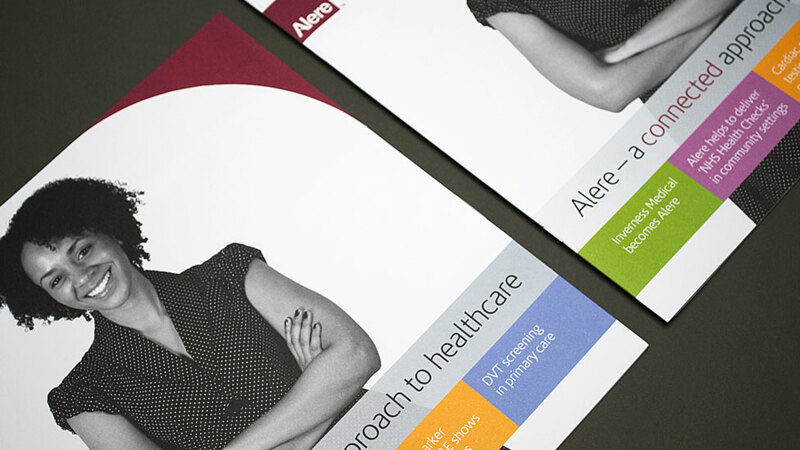 The brief was to create something which was more friendly and informal than a corporate brochure, but still allowed Alere to get across corporate and product messages. 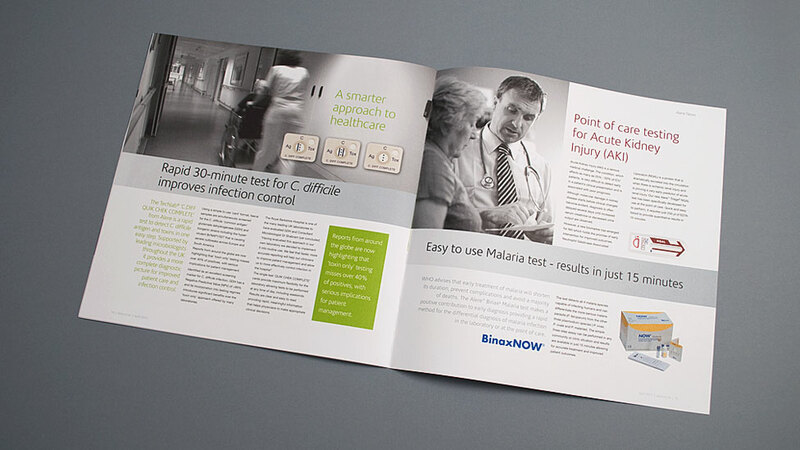 As this was to showcase the new brand to its maximum effect, a traditional newsletter design wouldn’t have carried the desired impact. The solution lay in newsletter design that’s rooted in innovation – it has more of a magazine feel, where page layouts are closer to a leading magazine than a traditional corporate newsletter. Our client’s recently refreshed brand style encouraged the use of dramatic black and white photography, adding the perfect accent to a contemporary newsletter design. When complemented with the dynamic brand colour palette, it allowed us to balance lifestyle and product imagery to create attractive yet informative page layouts. “We find it tremendously efficient working with Parker Design. Having direct access to their designers means that we can maximise our marketing spend. 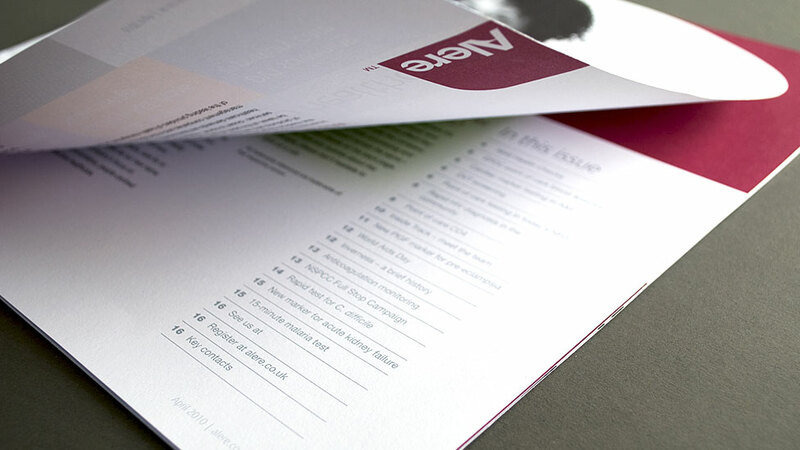 To add an extra element to the newsletter design, we shied away from the expected A4 size, instead designing the newsletter to an oversized square format, together with bespoke square envelopes for it to be sent out in. 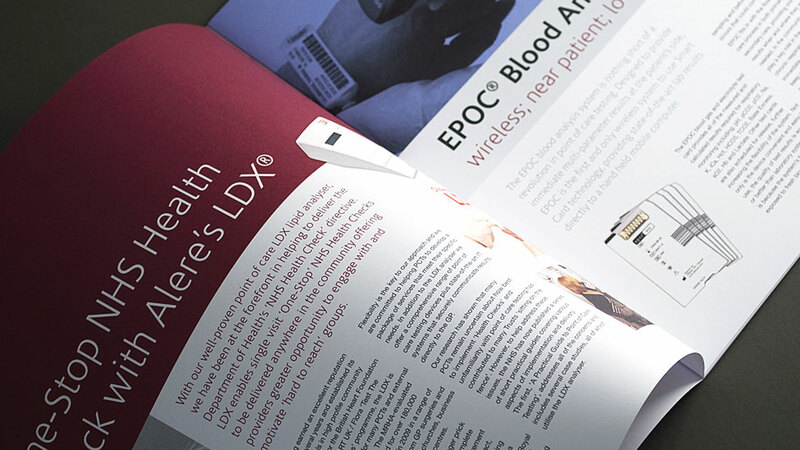 To ensure the newsletter design appealed to all the senses, we printed on a heavy uncoated cartridge paper giving it a wonderful tactile feel to the touch. 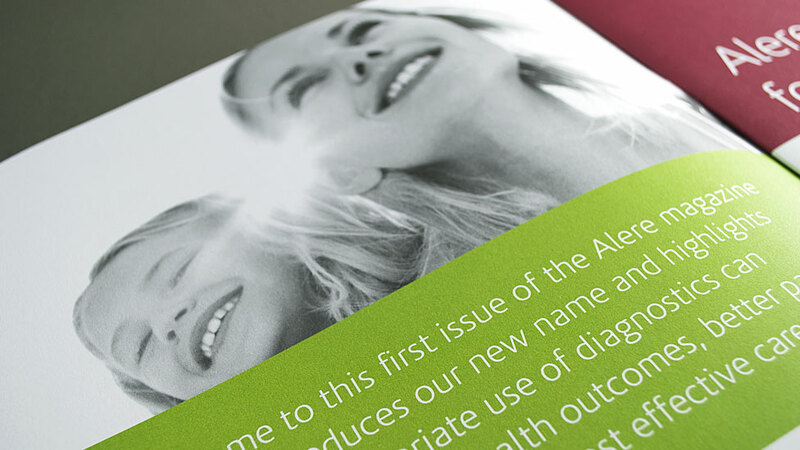 A nice finishing touch was the die cut radius corner on the top right hand of the cover, echoing the shape of the new Alere logo, and embedding the new brand in the mind of the reader from the moment they first hold the newsletter. The finished design was a huge hit not only with Alere, and more importantly with their customers. 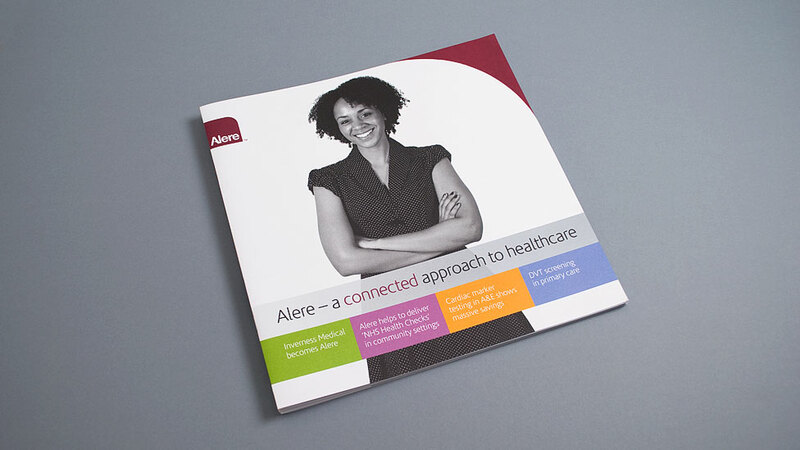 We went on to design a scaled down version for a different area of Alere’s business, following the same format. 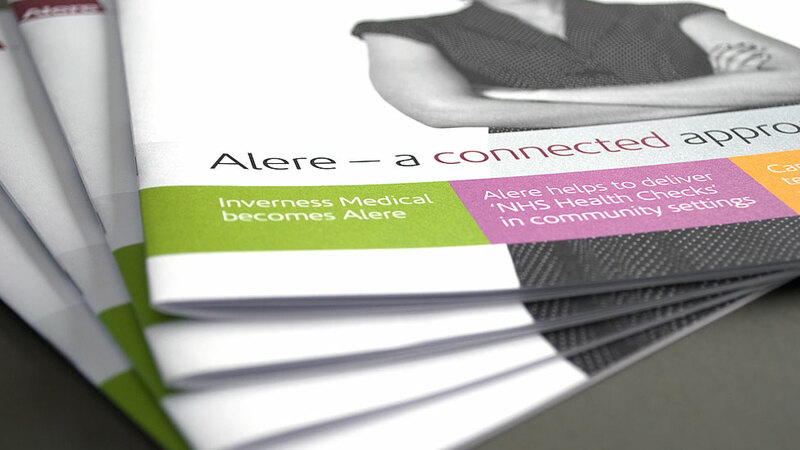 The success of the newsletter was confirmed when Alere’s European businesses took our model and replicated it as part of their brand launch across Europe.